What was interesting to me, is that i regularly sign my name to the bottom of my emails with where i am and this odd date format. And i could be corresponding with someone for months until i got to March or September, before they would ask what these strange words mean. But when it got to be pregnant animals or animals in heat, i needed to explain myself. And then as most funologists do, we took a good thing and went too far and started making up our own month names. April 2010 was called “Ipad” for this new products release (and then when Bochie ordered one the month name changed for where it was in transit like “Ipad in Hong Kong”. March of 2002 was called “Battle for Baghdad” Months are named after friends kids who are born then. I am calling this month Mubarak Falls. It is my wish. What comes next in Egypt will not be easy. 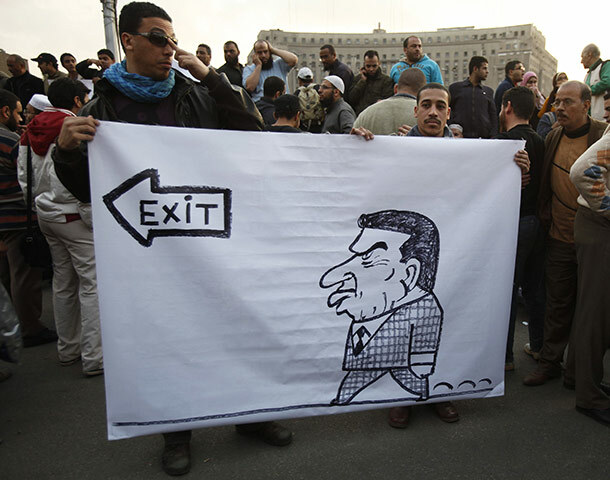 But as Gandhi said “All dictators fall” it is time for Mubarak to go. Not only Mubarek needs to go, but the entire regime. Portland indy media reports that the recently appointed V.P. is the point man in Egypt for extraordinary rendition proceedings and al-see-eye-ay-da point man for years now. He has been positively ID’d as having personally tortured prisoners. Mubarek going is not enough. The next time someone in your sphere of influence is buying Apple stuff, feel free to send ’em my way. My supply of discounted schwag is finite, but it’s rarely used up. @JBird: Oh, i dont doubt the whole crew needs to be swept away. Well, it seems that your blog broke the story before it even happened! Could you please name next month “Angie magically wins 10 million dollars and starts a fabulous new community with her friends” ?